Seven startups have been selected for this year’s FinTech Innovation Lab in London. The startup technologies include advanced analytics systems, open source trading systems and financial control systems, all designed for the financial services sector. 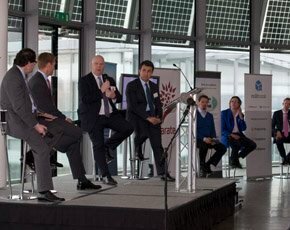 The Lab, which was launched by Accenture in 2012, is a collaboration with the TSB, City of London Corporation and is supported by the Mayor of London. The chosen startups, which include Erudine, FinGenius, Logical Glue, PhotoPay, PixelPin, Squirro and uTrade, were chosen by industry executives and will receive mentoring over the next 12 weeks in hopes to develop their potential ideas into businesses. Kit Malthouse, Deputy Mayor of London for Business and Enterprise said: "Startups are critical to driving growth in our economy and it is absolutely vital that we foster their entrepreneurial talent. These types of companies can struggle to get their products in front of large organisations and accelerator programmes like the FinTech Innovation Lab provide a gateway to success while helping to ensure that London maintains its status as the global centre for finance." The entrepreneurs will also take part in panel discussions, workshops, leadership coaching and networking opportunities during their time at the Lab. And at the end of the programme, the startups will present their ideas to potential investors and industry executives. Bank of America Merrill Lynch, Barclays, Citi, Credit Suisse, Deutsche Bank, Goldman Sachs, HSBC, JPMorgan Chase, Lloyds Banking Group, Morgan Stanley, RBS, UBS and VocaLink, the UK and international payments systems provider. Other participating organisations include Euclid Opportunities, the Greater London Authority and UK Business Angels Association. Last year, startups Digital Shadows and Growth Intelligence took part in the Lab which saw them being mentored by executives including Alistair Grant, EMEA CIO at Citi. "We met a number of startups through that initiative," said Grant. "From our perspective, it enables us to bring the outside in, and choose what to bring into Citi from a whole branch of different startups. Big data, cloud, agile computing - we’re really keen on all of those areas, and it was great to work with startups thinking in the same vein just a little bit quicker than we are." Richard Lumb, group chief executive, financial services at Accenture said that over the past nine months the startups involved in the 2013 programme have collectively raised over $10 million in investment and have increased their employees by 41%. • Erudine provides systems to the finance industry that look at operational processes and behaviours and suggests improvements in line with regulation and compliance. The system uses a case-based reasoning approach to build and maintain systems that manage complex changing regulations. Changes to the rule sets and classification of underlying data structures can be made with minimal downtime. • FinGenius (a London Brand Management Company) uses Artificial Intelligence and real-time big data analysis to make it easier for non-technical users to find information through the use of natural language processing. • PhotoPay simplifies payments by allowing you to take a photo of a bill, scan a payment slip or open a PDF file with your mobile banking app and make a payment with one tap. • PixelPin provides a personalised user-friendly single sign on using pictures instead of passwords. PixelPin’s technology reduces fraud, increases activity, and reduces the risk and cost of forgotten passwords. • Squirro is the leader in Context Intelligence, combining structured and unstructured data to provide the ‘Why’ behind the data. The “Why” turns disparate data points into a coherent story for better, more effective decision-making. • uTrade Solutions provides Open Source Trading Technologies creating a more efficient, innovative & collaborative ecosystem for financial markets.